DETROIT (AP) – The six top-selling automakers in the U.S. reported sales declines last month as demand seems to be slowing after seven straight years of growth. General Motors, Ford, Toyota, Fiat Chrysler, Nissan and Honda on Tuesday all reported weaker U.S. sales than a year ago. Industry analysts expected April sales to be down anywhere from 2 percent to 4 percent, but still run at a healthy annual rate of around 17.1 million vehicles. Kelley Blue Book says it looks like 2017 U.S. sales will fall short of last year’s record 17.5 million for the first annual sales drop since 2009. It expects full-year sales of 16.8 million to 17.3 million. Ford, which reported a 7.2 percent decline due largely to car demand that tumbled 21 percent, said that it’s still getting healthy prices for its vehicles as people load on more options. Vice President of Sales and Marketing Mark LaNeve told analysts and reporters that April’s decline is nothing to panic about. “We have to let the year play out,” he said. “In a plateauing industry you’re going to have some months that are up and some that are down,” he said. Economic fundamentals still point to strong sales, LaNeve said, including rising consumer confidence, low gas prices, an aging fleet of cars and trucks on the road and relatively low interest rates. Even full-size pickup trucks, which had been selling briskly for much of the year, posted a sales decline. Ford, GM and Toyota pickup sales dropped, while Fiat Chrysler’s Ram sales were up 8 percent. At Nissan, overall sales fell 1.5 percent as SUV demand couldn’t overcome slowing car sales. Sales of the Rogue small SUV rose almost 40 percent, but car sales fell nearly 14 percent. At General Motors, sales dropped 5.8 percent as strong performances from some SUVs and the Cruze compact car couldn’t offset falling pickup truck demand. Toyota reported a 2 percent sales decline for the month as healthy sales of the RAV4 small SUV were overcome by falling demand for cars such as the Camry and Corolla. Fiat Chrysler sales fell 7 percent for the month as it continued to exit the small and midsize car business. Sales of the normally strong Jeep brand fell, by 17 percent. Honda sales fell 7 percent as Accord midsize car sales fell 15 percent and couldn’t be balanced out by a 13 percent jump in sales of the CR-V small SUV. Of major automakers, only Hyundai and Volkswagen reported increases, just over 1 percent for Hyundai and a 1.6 percent gain for VW. Hyundai was boosted by record sales of the Tucson small SUV, while VW gained over sales that were depressed a year ago by its diesel emissions-cheating scandal. As automakers released sales data Tuesday, stocks of Detroit automakers came under heavy pressure. Ford shares hit a new 52-week low of $10.90 Tuesday down more than 4 percent in afternoon trading. GM stock fell nearly 3 percent, while Fiat Chrysler shares tumbled over 4 percent. Toyota and Nissan shares, however, rose slightly. While sales still are healthy, automakers are offering deals to compete for a piece of the shrinking pie. But there are signs that the industry is relying too heavily on incentives. The average price paid per vehicle is starting to wane after years of steady increases, even for popular SUVs. Previously SUV prices kept growing while car prices fell due to sagging demand. The average price paid for an SUV in April was $33,165, according to the consulting firm J.D. Power and Associates. That was down 2 percent from last April. One reason for the decline was that more customers were buying smaller, less expensive SUVs this year. But another was a whopping 18 percent increase in incentives, which hit $3,338 per vehicle. Jeff Schuster, a senior vice president at the forecasting firm LMC Automotive, said automakers are fiercely competing so they don’t lose sales in the hot SUV market. Last month, incentive spending was up 11 percent on cars, to $3,903 per vehicle. The average price paid for a car was $25,516, which was about the same as last year. 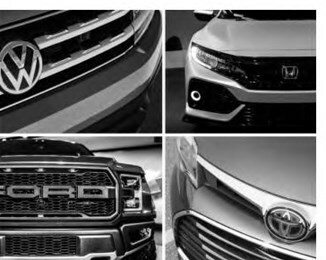 Pickup trucks were the only segment in which automakers offered fewer deals. Incentive spending was down 6 percent to $3,276 per vehicle. Customers were willing to pay $31,438 for a pickup in April, which was 1 percent more than a year ago.